… serving as a long-term encouragement and accountability. In the video below we define each of these key phrases and answer six key questions about being an advocate. What are the characteristics of a good advocate? 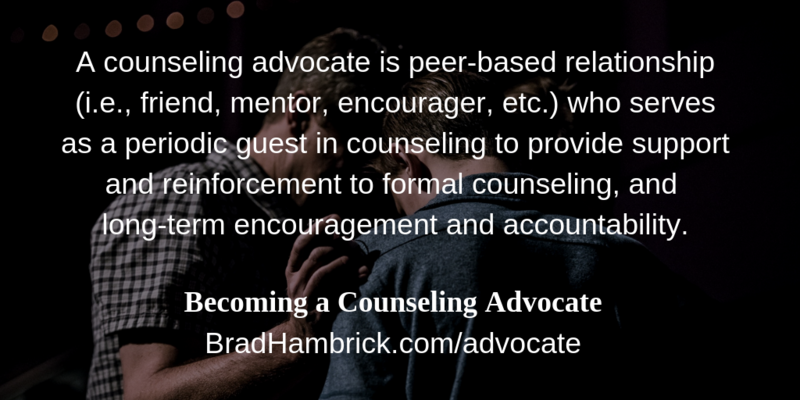 What should an advocate do when attending a counseling session? What should an advocate do between counseling sessions? What should an advocate do when counseling has concluded? What paperwork needs to be signed for an advocate to participate in counseling and what does it mean? What additional training is advised for an advocate? A counselee – If this is you, then this training should orient you a possible supplement to your counseling. If you think an advocate would be a good fit for you, then your next step is to discuss this possibility with your counselor. A potential advocate – If this is you, thank you for being the kind of friend who would be invited into this type of role. This packet is meant to orient you to your role as an advocate. It is likely that your friend’s counselor may recommend beneficial resources related specifically to your friend’s struggles. Below are a few resource recommendations that may be a helpful supplement to your role as an advocate. Side by Side by Ed Welch. This is a brief book (176 pages) on how to be an intentionally helpful friend. In Our Lives First by Diane Langberg. This is a six week devotional (160 pages) written for counselors about how helping others through hard times effects the soul of the counselor/helper. If you are looking for subject specific resources, there is a topical index on the side bar of my site.